"They are all doing this in their own time." Telecom Employees replying to public forums in their own time. I am lost for words at this point. Also even on a business connection I believe he's only paying for 48kbit? Allanhall: "They are all doing this in their own time." Excuse me? As being a past Telecom employee and replying on this forum as a Telecom employee I know for a fact we do it in our own time. We're were never paid to post on Geekzone and my job title was not "You must post on Geekzone" - Stop being so rude, we're trying to help but now, you've got to the stage you're beyond help and simply not accepting the truth. I am In the CBD in a purpose wired building. I have 12 PCs on the network . This test was done bypassing the switch, one computer plugged directly into the modem ." A/ My network ? If it is my network and I am plugging a single computer into the Modem , by passing the switch, How does my network get involved ? If someone that has suggested, torrents, other computers etc etc could clarify how computers that are not connect can affect these tests ? B/ Does the network mean Telecoms network ? What approx did the speed use to be and have you tried another modem? This is what I am getting through the internal network now and this is what I have not seen for weeks. But at this present time there is not an issue. So does this rule the modem out or can that fluctuate also? Your network is basically every piece of computer equipment in your building, including cabling, computers, switches, printer, devices connected via WiFi etc. A particularly common problem when someone complains of slow downloads, and high latency (ping) is something on your network uploading a lot of data at a time - an upload can have a very detrimental effect on download, and can often be difficult to troubleshoot. There could be congestion outside of your network (i.e. Telecom etc. ), but statistically speaking, it's far more probable to be in your premises, hence why everyone is looking there first (Telecom, and everyone else!). You've got the first step sorted - 1 computer direct to the modem for testing - just make sure there's nothing connected by WiFi as well. What OS do you use? Do you back up to the cloud or anything along those lines? Also, try clicking the quote button at the top right of a post you want to quote - it will make it far easier for the rest of us to read! Allanhall: This is what I am getting through the internal network now and this is what I have not seen for weeks. OK, that looks pretty good. It is probable there's nothing wrong with your modem. 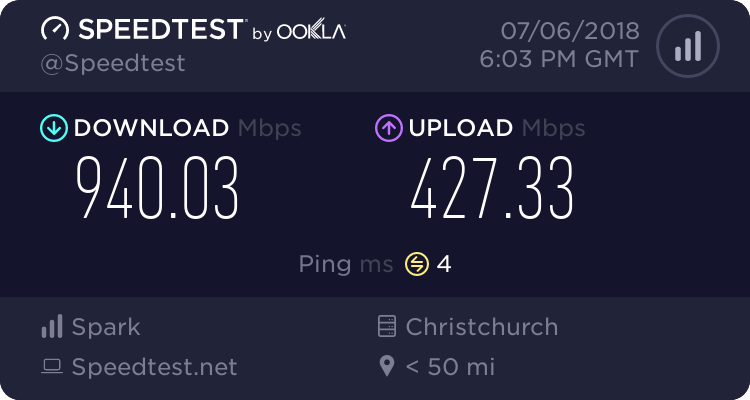 Given the significant difference in both speed and latency between the good and bad tests, it does point to network congestion (too much data trying to get through at the same time). As noted earlier, this is usually internal to the end user's premises, rather than the ISP, but not in every case. Telecom currently have a reputation for having good consistent speed in general, so it's less likely to be them. Have you noticed any pattern to the problem - particular time of the day or week when it pops up etc? And roughly where are you - what town or suburb? RunningMan: And roughly where are you - what town or suburb? Right in The middle of the New Plymouth CBD and no real pattern that I can see. The test that was shown first was a windows 7 machine plugged directly into the Modem. The other XP via the network and it made no difference. The current one same XP machine. We do move a lot of larger ISO files ( well we try to lately the connection speeds been making it difficult. ) into the Amazon Cloud and I am aware of when this happening an make sure that Uploads and downloads are not what is causing it. OK, next time the problem shows up, try doing some traceroutes to common NZ sites like TradeMe, Stuff, etc. and see if they help pinpoint where the issue lies. EDIT: There's a few people around here who probably have a good working knowledge of the network around New Plymouth, and will be able to advise if there's any known specific congestion issue at locations around there. Allanhall: I do like hearing about solutions. Does telecom pay you guys a retainer, You helping them write the how to blame the client manual ? "have you considered the machine your testing from?" Yes, Its exactly what I unplugged from the network and directly into the router, and have tested from more than once machine. Why keep doing it when the first test showed the network was not effecting it ? "have you insured devices are disconnected/turned off? if it is say, saturation from torrent seeding, then whats the bet the machine in question happens to be left on after the owner has left the office?" I just about never leave the office unfortunately. Need to add these couple " If it doubt always tell the customer its there machine or Line. " If in doubt tell them it must be water in the line. 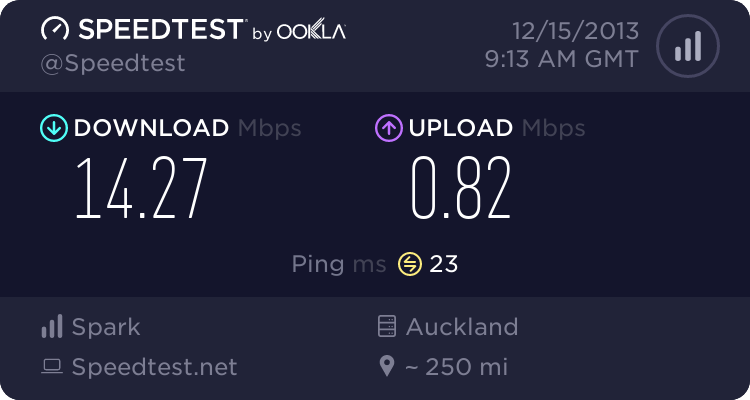 nothing has been touch in the office since the last speed test and this is what I am getting today. i explained why it looks like what it does, sure, it could be upstream, but considering you state your in central city, the likelihood of local congestion, is far more likely to be on your internal network. clearly you believe everyone who suggested it to be wrong, and that is fine, but at the end of the day it is what it very clearly looks like, and if its the case, im sure the telecom reps that offered their support here, will spot it pretty fast. just remember, speedtests cant always be accurate, we can only go off what you have shared. we are not physically looking at it, simply drawing conclusions from what tests and examples you can provide. From that reply it doesn't sound like you have ruled out the possibility of a rogue machine (malware/adware/torrents/etc) on the network hogging bandwidth. Does your router/gateway have bandwidth graphs?